What platforms are the SMS Replier compatible with? 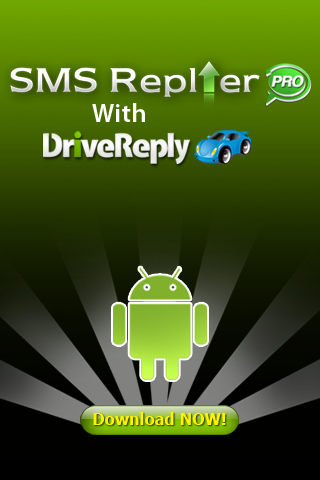 SMS Replier is currently compatible with the Google Android platform. Android platform phones have the fastest sales growth rate at this time, this is why we chose to launch on the Google phones first. The Blackberry version is in production along with PALM and Windows mobile phones. Those platforms should be ready in the coming weeks. We anticipate that the I-Phone version should be ready in Mid Summer. How do I make Auto Drive work? AutoDrive is on automatically unless you turn it off. When you do turn it off, it will stay off until you turn it back on, or in 150 minutes, whichever comes first. Normally you would turn it off if you were on a public form of transportation like a train, cab, or bus. You will also likely wish to disable it if you are a passenger in someone else’s car. Can I make my own custom messages? Yes, we provide the default set of messages for you as a convenience and to demonstrate the instances where an app of this nature would be found to be very useful. If you find that you are commonly in a situation where you cannot answer your phone and want to reply that you are in the process of what ever activity that is, you may wish to create your own message by pressing the ADD button from the main screen, then Title your message, insert the message body text that you desire and press add. If you make a mistake, there is an edit button as well to make changes. I got a “not responding” message, force quit or wait, what do i do? This happens occasionally when the phone is downloading simultanesly emails and text messages. It is not crashing. If you get this message, press the wait button, as pressing the force quit button will reset the timer for your message set. When I change the message, the wrong message is delivered to my friends… Why? When changing messages, allow 20 to 30 seconds between each message for the systems to update. Thought it appears to be significant, the issue does correct itself. If it does not correct, in severe cases, just reboot your phone. Contact us at info@smsreplier.comwith any other questions.